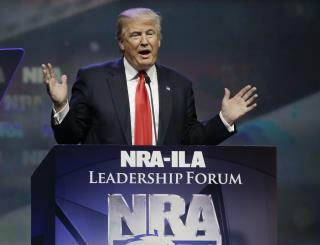 (Newser) – The NRA endorsed Donald Trump during its national convention in Kentucky on Friday, NBC News reports. According to CNN, Trump called the endorsement a "fantastic honor." In a speech immediately following, he said American citizens "sitting in an apartment" need guns because “outside is tremendous crime; tremendous crimes of all kinds," Politico reports. Trump said Hillary Clinton plans on destroying the right to bear arms. “She wants to abolish the second amendment," ABC News quotes him as saying. "She wants to take your guns away.” He said that's why he's going to add "Heartless Hillary" to the list of nicknames he uses for Clinton. Clinton has never advocated for repealing the second amendment. If a teacher or other school worker has had professional military or police training in the use of firearms, then why not? Clearly, it should be an issue for local schools to determine what is best for their communities, schools and kids. No need for a federal policy, one way or the other. O.K. Donald but only if I can wear a gunbelt with my gun slung low and bandoliers so I can look like the cowboys in the movies I saw as a kid. You don't even believe the changing attitudes that you put out, you are so off the cuff that I really wonder about you. I can see the bodies piling up already from all the people caught in the crossfire of a shootout. You idiots that think everybody should be armed may soon experience the feeling of what it's like to be shot if Trump becomes President. It's not like the fantasy shootouts on TV and in the movies. You're not going to like it.